It was quickly identified as a “white slant-line” (Geometridae: Tetracis cachexiata)–a fitting common name–and I filed it away and didn’t think much of it. The following May, this photo was posted of a similar scene in Pennsylvania, and I thought it was an interesting coincidence. Then in May 2012, Paul Goldstein included a photo of the same thing in the slideshow for his keynote address at the 5th Nantucket Biodiversity Initiative Week. It was tucked off to the side in a collage of photos and he didn’t say anything about it. I asked him about it afterward, and he said he had thrown that in just to see if anyone would notice: this is a recurring phenomenon that he has seen repeatedly and for which he has no explanation. We both feel like there’s something interesting going on here and are determined to get to the bottom of it, but neither of us has come across a slant-line on a lady’s slipper since then. According to David Wagner’s Caterpillars of Eastern North America, the caterpillar of this species is a stick-mimicking inchworm that feeds on a wide variety of woody plants; there is no indication that lady’s slippers or any other orchids would be food plants. Well then, you might ask, isn’t the moth just being fooled by the scent like a bumble bee? Maybe, but why does it rest on the flower for a long time, not fluttering and trying to find a way in? And why just white slant-lines? A Google search for “lady’s slipper moth” turned up, in addition to my own post on BugGuide, this one from Berlin, MA; this one from Pennsylvania; this one from South Carolina (in this case a pair of photos, with the photographer noting, “I’d really like an identification of this moth. In addition, I’d like to know why it is positioned on the lip cleft where pollinators normally enter. These two moth images were taken on two different flowers early in the morning the same day about 1/2 mile apart.”); and the second photo on this page, from Tennessee. There is also this note from Illinois, and I had previously found this shot with a yellow lady’s slipper (Cypripedium calceolus). The only image that came up showing a moth other than a white slant-line was this one of a luna moth on a showy lady’s slipper (C. reginae). I suspect that one was posed, since luna moths are nocturnal and aren’t typically found resting on prominent objects in the daytime. They also don’t feed as adults–they don’t even have mouths–so I don’t see any reason one would be visiting a flower of any kind. Any information or observations that might help illuminate this mystery would be most welcome! [This paragraph added after discussions in the comments below:] Google searches for “Tetracis cachexiata flower” and “white slant line moth” turn up, in addition to several photos of this moth on lady’s slippers, a few photos each of wild blue phlox (Phlox divaricata) and the introduced European mustard known as dame’s rocket (Hesperis matronalis). I also see one example of a white slant-line visiting mountain laurel (Kalmia latifolia) and one on some kind of honeysuckle (Lonicera). A search for “white slant line moth on flower” adds white trillium (Trillium grandiflorum) and bearded German iris (Iris germanica) to this list. So this moth does visit other, totally unrelated flowers, but the lady’s slipper association seems to be the most frequently observed one, and it still appears that no other kind of moth is attracted to lady’s slippers. This entry was posted in Uncategorized, Unsolved Mysteries and tagged Cypripedium, Cypripedium acaule, Geometridae, lady's slipper, moth, orchid, pink lady's slipper, Tetracis cachexiata, white slant-line. Bookmark the permalink. I’ve nothing to add that would help, only the note that I photographed the same thing in Shutesbury a few years back. learn that others have found the same association. 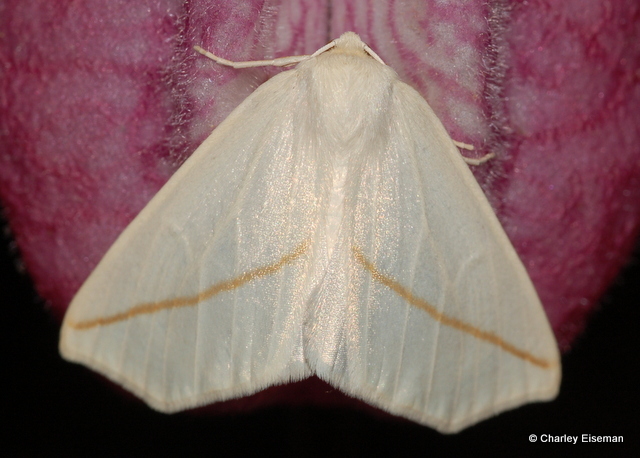 And now I just noticed that if you google images of white slant line moth, most of the photos showing it in association with a flower, show either pink lady slipper or a purple/pink phlox like flower. 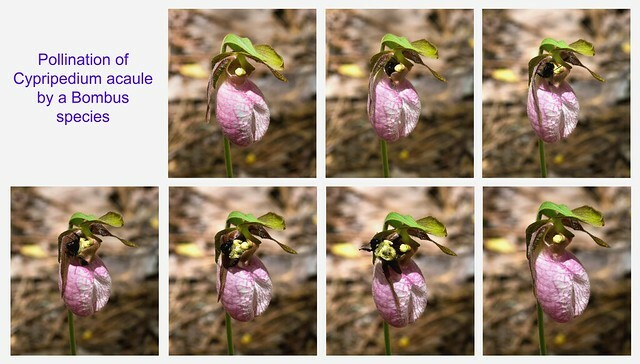 Interesting that there is not a lot of variation in flower species, and that the lady slipper figures prominently. Hi Janet! I’m glad you saw my post. Yes, I had noticed one shot of the phlox-like flower before, and when I googled “Tetracis cachexiata flower” just now I saw two different ones. On closer inspection, the flowers in both photos have four petals rather than five, so I suspect they are the introduced mustard Hesperis matronalis (dame’s rocket). Very curious! OK, yeah, I see the ones with Dame’s Rocket, but when I google images of “”white slant line moth” I get several pics of the moth on wild blue phlox, one of which is in the 1st line. Google yields different results for different people, I think, depending on your search history. In any case, there seems to be little variation of flowers on which this moth has been photographed. Ah, you’re right–when I search “white slant line moth” I see the phlox photos, as well as one each on mountain laurel and honeysuckle. So the moth does apparently visit several different flowers, but the lady’s slipper seems to be the most commonly seen association. I’m commenting, because I’m hoping you’ll get an answer. Very curious. 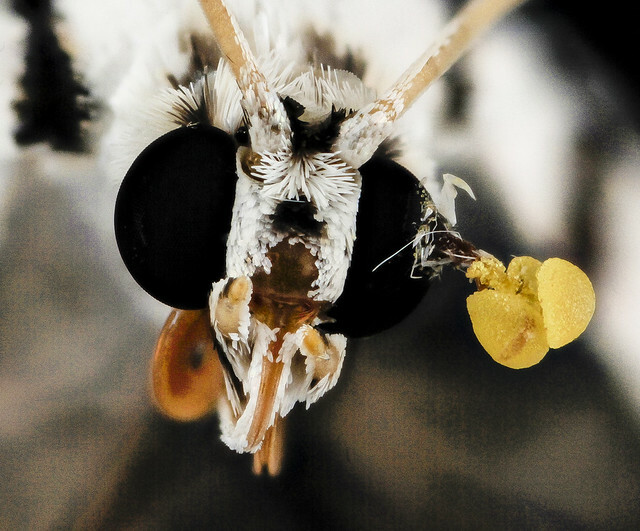 Below are two shots of a Conchylodes moth with a Crane Fly Orchid pollinia planted on its eye. I think the relationship is known and the Crane Fly Orchid, of course, has a very different floral type. However, it may be the case that your Geometrid is also and orchid pollinator of other species and it generically attracted to the scent of orchids? Hi Sam– That would make sense, but I’ve seen no evidence that this moth visits any other orchids. It has been found on a few other flowers though (see above discussion with Janet Pesaturo); maybe they are somehow chemically similar, despite being otherwise completely unrelated? Charley, in addition to Dame’s rocket and wild blue phlox, I see a pic of it on mtn laurel and another on a tubular white flower that I cannot identify. Try googling images of the common name, and maybe you get a wider search. Yes, I think that’s honeysuckle (I just replied to your comment above, and was editing my comment to Sam while you were leaving this comment). Hey Charlie! You are really on top of this. Thank you so much for extending the mystery of this phenomenon. My images (Cyp. acaule in South Carolina) represent the only time I’ve seen this moth. Although Cyp. acaule is not known to emit a fragrance, there is something going on here. Please keep me in the loop if you come across any more information. The Tennessee photo is mine (Baskins Creek Trail, Great Smoky Mountain National Park) May 1, 2011. Thanks for the note. I’ll keep an eye out for other sightings. A search of “white slant line moth on flower” turned up images of the moth on Large White Trillium (Trillium grandiflorum) and German bearded iris. In most instances the images seem to catch the moth just sitting on the flower petals, though in my Pink Lady’s Slipper photo and one other I found, the moth appears to have its face in the fold of the slipper. By the way, I have your Tracks and Sign book with Noah and have spent many delightful hours perusing it. Thanks for such a wonderful book and your continued investigation into this fascinating world. Thanks for the comment, Margie– I’ll add those two plants to the list at the end of my post. Nice! Thanks for sharing that; I’ve never witnessed this in person, nor have I seen photos of it before. I just added a link to your photos in my post. What a terrific post! In April 2012, I found the same kind of moth resting on a lady’s slipper. A photo of it can be found here: http://rmhood.smugmug.com/Other/365/21377925_629Kgb#!i=1801770877&k=QB442Tb I am fascinated and can’t wait to learn more! I have long suspected that this orchid produces a pheromone-mimic to attract pollinators, but I can’t find any confirmation online. As you point out, the orchid offers no nectar reward. Surely it takes more than just a random nice smell to trick a smart insect like a bumblebee (they’re all about learning how to get nectar from different flowers) into entering a flower not once, but twice, and in a habitat they don’t normally visit, to boot (*I’m* not accustomed to seeing bumblebees in the woods where my local lady’s slipper orchids grow, anyway). Granted, they don’t seem to be pollinated successfully very often, but still. If the orchid does produce a pseudo-pheromone, perhaps the chemical also, by chance, approximates the pheromone that white slant-lines use to find each other. And perhaps the showy lady’s slipper’s pseudo-pheromone (if it also has one) is similar to that of skippers. 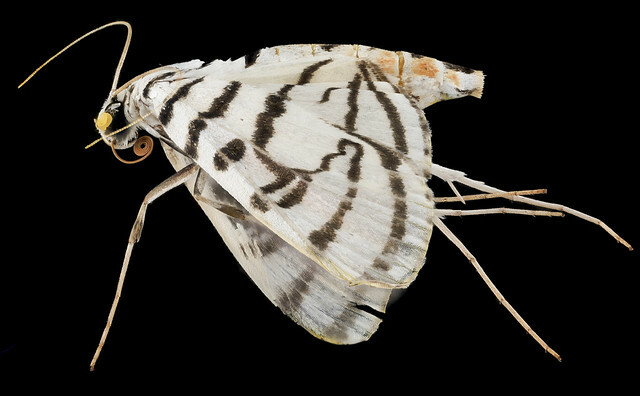 If so, this could be a case of amensalism, a relationship that harms one species (the moth, which wastes time waiting for a mate at the flower, or the skipper, which perishes), but has no effect on the other species (the orchid, which neither benefits nor suffers from the presence of the moth or skipper). It would be interesting to know whether the moths at the flowers are males or females. Unfortunately, I can’t find anything online to suggest that they’re at all sexually dimorphic. That said, I can’t help but point out that the moths *may* get photographed on lady’s slippers more often than other plants only because people pull out their cameras for lady’s slippers more often than for, say, Dame’s rocket. 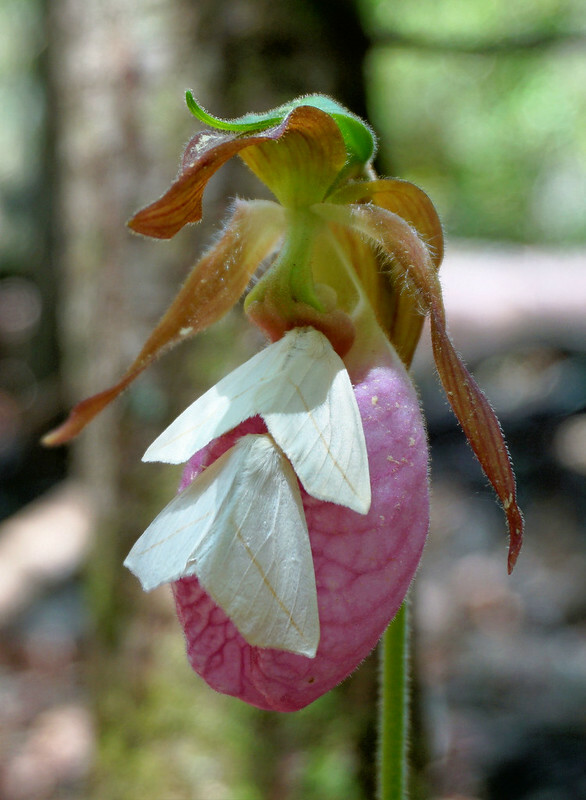 That no other moths seem to be associated with lady’s slippers suggests that the observation is not just a result of sampling error, but it’s worth bearing in mind that the relationship may not be as strong as it appears based on the photos posted on the web. Thanks for your comments. I don’t think it’s particularly unusual to see bumblebees in the woods; I often see them visiting Solomon’s seal and other understory flowers. It definitely would be worth investigating whether both male and female slant-lines are visiting the lady’s slippers; I think the males would have somewhat broader, more feathery antennae, but these often aren’t visible in photos. I agree that sampling error needs to be considered here; when I first wrote this post I had hardly been able to find any photos of slant-lines on other flowers, but as the tacked-on final paragraph indicates, they have been observed on a number of other, unrelated flowers. It is still strange, though, that no one seems to have seen any other moths on lady’s slippers. Dr Rod Peakall (http://biology.anu.edu.au/rod_peakall/) has done a lot of work on sexually deceptive orchids in Australia. It is a fascinating subject and I wonder if that could be involved here. Could the moths be gathering the scent from the lady slipper and using it for mating? The thought has crossed my mind. Determining whether only one or both sexes are visiting lady’s slippers will be an important first step in testing some of these hypotheses. I believe I read once that the bees that pollinate Brazil nut flowers depend on a certain species of orchid for this very reason. I sense an experiment involving lots of tanglefoot on lady’s slippers next year. Or how about some choice assays to measure attraction different plant species? Then maybe some gas chromatography-mass spectrometry to identify scent compounds? That link didn’t work–can you try again? Charley, your post came up via another discussion on Facebook today so I re-read it. One of my ‘best’ images from last year was a White Slant-Line Moth, Tetracis cachexiata, on a Pink Lady’s Slipper we found on a Mass Butterfly Club hike on Little Mount Tom in Holyoke, MA, on 5/22/15. Please repost if you get more recent data on the story behind this association! Thank you for this post. Jim Fowler just pointed me to another example–this one with the slant-line almost inside the front slit of the pouch. 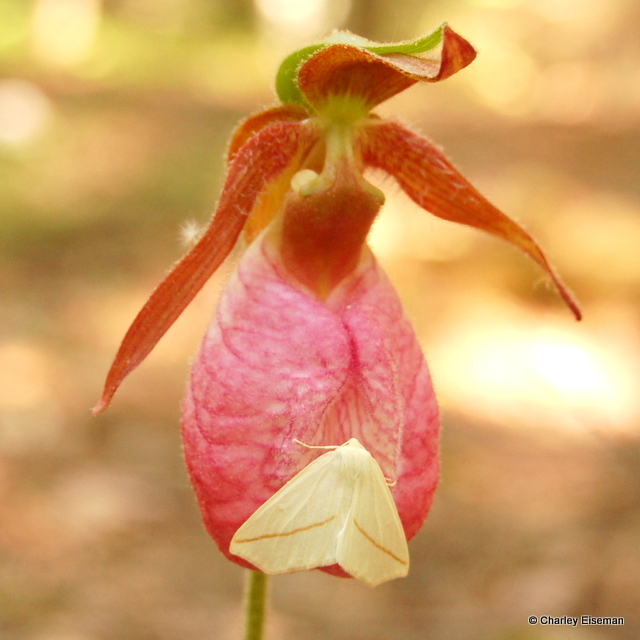 As many of you know, I’ve been studying the demography and reproductive biology of Pink Lady’s-Slippers (CYAC) in the GW Natl Forest, Rockingham Cnty, VA and Greenbelt MD study stands for 40 yrs, measuring every one of 6500+ individuals and documenting the visitation rates/pollination frequency/fruit set, etc. I too have seen Tetracis cachexiata (and much more rarely other unidentified adult geometrids and arctiids,) perched on the labellum of CYAC about 2 dozen times in the 4 decades. If my memory serves correctly, all the white slant-lines were seen on the CYAC in early morning, mid summer, not in hot afternoon. In addition, I have found singleton larvae of Geometridae and Tortricidae (different flowers, ca 30 different occasions) and small adult Diptera inside CYAC flowers; in a couple of those cases and about 3 dozen more instances the column (complex structure of pistil and anthers) was eaten by a lep larvae, which suggest some lepidopterous herbivory. These couple dozen observations are, of course, very rare observations/cases out of the 1/4 million observations I have been made that had no leps; never have these few lep observations been associated with pollen removal or deposition. Therefore my observations deny any intimate lep-CYAC association. Indeed, large burly hairy Bombus bees and related bees are the essential pollinators (as Jim Fowler’s gorgeous photos document), but even visitation (pollen removal) rates by bees are rare (ca 23%) and actual pollen delivery to stigmata is very rare, averaging <3% in normal years; these bees are not dependent on CYAC, which indeed provide no nectar or pollen for their consumption, but the bees mistakenly visit CYAC incidental to other more major rewarding ericaceous (at my sites) flowers. My lowland stands of CYAC are more fragrant than the highland (760 m) stands. I know nothing about how large the white slant-line population is at my sites – seems rare but it must be larger than the couple dozen I've seen. In the absence of detailed searches for white slant-lines resting diurnally on other places (underside of shrub and tree leaves, rocks), and dismissal of any significant Tetracis-CYAC relationship, I have assumed the few white slant-lines are simply resting on CYACS as the brightest substrate with which their quite bright coloration best camouflages (admittedly not very well). Does deserve more investigation – quite likely I have overlooked something as all seasoned naturalists have/do. You can add this photo of a pair of white slant-lines on a pink lady’s slipper, which I took at Savage Gulf on the Cumberland Plateau a week-and-a-half ago. 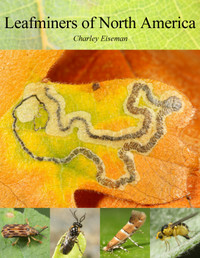 Interestingly, a Google search on “white slant-line moths” shows “Slant-lines and Lady’s Slippers” as a related search. (Which is how I ended up here.) So I’m guessing this must be a fairly common query. Judging from the position of the two moths it seems fairly certain they must be attracted by some scent coming from the interior of the lady’s slipper. Two on one flower! I think that’s a first. Thanks for the addition. 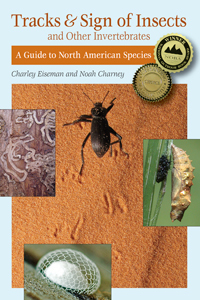 Just coming to this bunch of great observations – I too have seen the two species interact locally (NY State and in particular NYC and Long Island/Weschester…) very interesting thoughts here. I can only add that the moths seem very abundant some years, most years, not so much…undoubtedly a factor about moth population – or just my coincidentally being in the woods to see them at some points in time – as opposed to the relative attractiveness of the Cyp flowers. I do have one question and that is about the “fragrance” of Cyp acaule. I have seen countless moccasin flowers in varying settings, and have NEVER detected any sort of fragrance. They very well COULD be, and my own “honker” is not picking it up, or they could be emitting a pheromone which is not fragrant to humans…how many folks out there have detected a fragrance from Cyp acaule? I don’t think I’ve ever picked up a scent from a lady’s slipper either. There are certainly lots of chemicals that are detectable to insects but not to us. Aha, that does it! All I did was copy and paste the link from H. Parmer’s comment above. Just to add another data point: A slant-line resting on a pink lady’s slipper today in the Taconic Hills of Columbia County, NY.